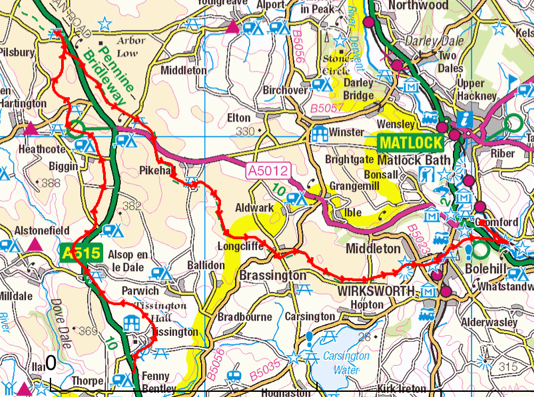 The White Peak Marathon goes from Thorpe (near Ashbourne in Derbyshire) to Cromford along two former mining railways converted to cycle paths. You are taken by bus to Thorpe and start on the Tissington Trail, then at 11 miles after 160m of gentle climb you U-turn onto the High Peak Trail with a descent of 250m, mainly down the three ‘inclines’ after 22 miles. The ‘Altitude profile’ on ViewRanger on my i-phone shows this rather well! I did the 2012 race in 3:56 and the only split I can remember is 21 miles at 3 hours. That the last 5.2 miles took 56 mins shows a dramatic slowing (from 8.57 minute miles to 10 minute miles) and I do remember walking 3 or 4 stretches. This year I was joined by my husband Dave on his 1st marathon. He’s often run the distance in fell races but never on the (relatively) level! I went off faster and he caught me at 2 miles, I never lost sight of him and got a boost at about 9 miles and overtook. The trail meanders gently uphill and the mist was blowing into our faces. 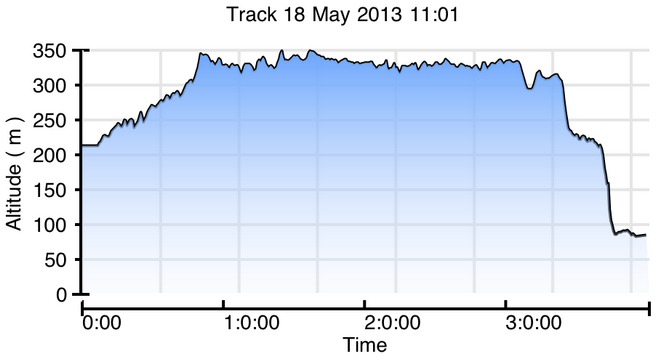 The psychological advantage of this was that you couldn’t see runners a mile ahead of you like you could last year. This is always a bit demoralising! Running a marathon is all about fractions – soon you are at 6 miles, which is nearly a quarter, then 10 miles, then half way. A half marathon runs in parallel but starts at the same time as the full. I crossed the half marathon Start line at about 1:45 so was pretty pleased with that. However at about 17 miles I began to feel my fingers going numb so I had my boiled eggs, a seed bar and dropped my glucose powder and Nuun (electrolyte) tablet into a cup of water at the next drinks station. Dave was carrying his Platypus but I didn’t carry a drink as there are 7 water stations, one of which you pass twice! I felt a big improvement but Dave and many others were still passing me. I passed the 21 mile marker at 3hrs 2 mins, a bit slower than last year but still running and going particularly well down the inclines. The bit from Harborough Rocks is home territory but certain sections still drag! I passed Dave on the final and longest incline and thought he would get me on the last ¾ mile section along the canal and although he didn’t, he was less than a minute behind. I was pleased with 3:54:14 – 2 mins faster than last year! 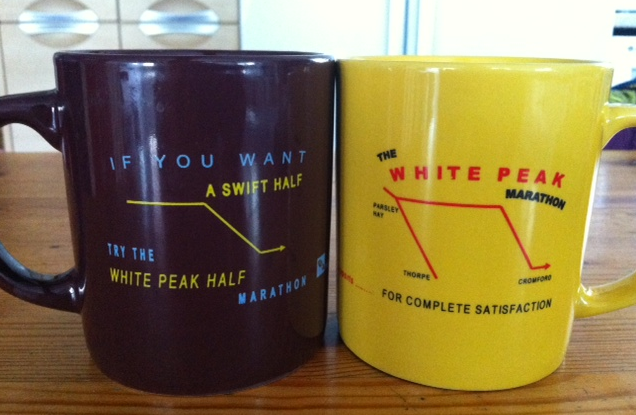 Matlock Athletics Club did a great job at organising a friendly race and a goody bag and mug at the end with a pun on ‘Swift Half’ and ‘Complete Satisfaction’!